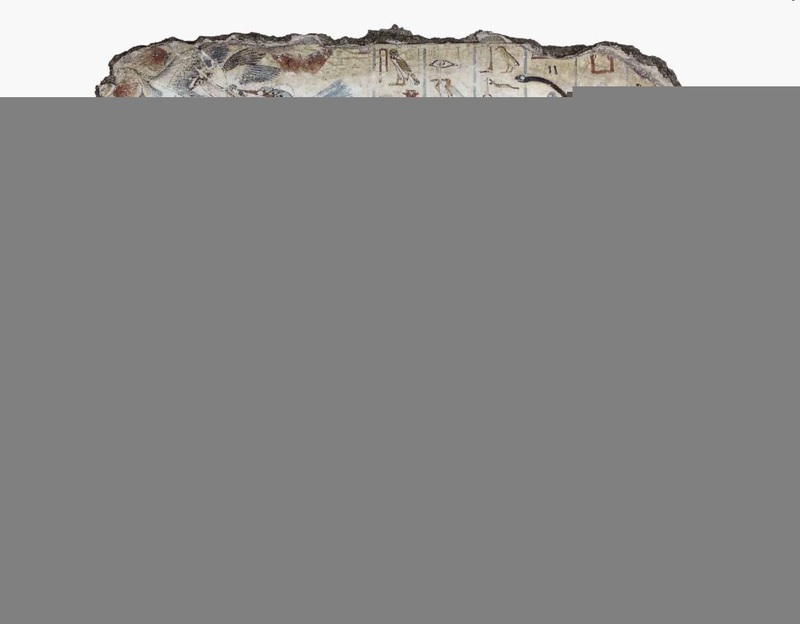 Тhis scene is one of eleven fragments from a tomb belonging to a 'scribe and counter of grain' named Nebamun. Stylistically the magnificent paintings, can be dated to the reign of Thutmose IV (1400-1390 вс) or Amenhotep III (1390-1352 вс). The paintings are distinguished from other Eighteenth Dynasty examples (about 1550-1295 вс) by the quality of the drawing and composition, and the use of colour. They depict the daily life of Nebamun and his family but their arrangement in the tomb, and much of the imagery used, points to their deeper significance in Nebamun's hopes for rebirth and renewal in the afterlife. Here Nebamun stands on a small papyrus boat with his wife Hatshepsut behind him and his daughter below. The hieroglyphs below his raised arm describe him as 'taking recreation and seeing what is good in the place of eternity', that is, in the afterlife.